Leave it to Mahmoud Ahmadinejad, the erratic president of Iran, to antagonize his few international supporters. Russian President Vladimir Putin and his yes-men spent months attacking the U.S. plan to put missile defenses in Europe, claiming there was no missile threat from Iran. But now the Iranian leader has hosted a TV spectacular showing the world Iran is indeed developing long-range missiles. 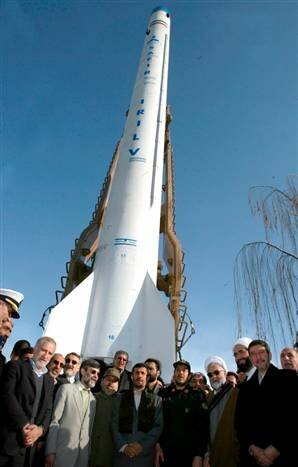 On Feb. 4, Mr. Ahmadinejad participated in a TV show of the opening of a new space center, personally issuing the order to launch a missile into space from a site in the Semnan Desert southeast of Tehran (right). The modified Shahab-3B medium-range missile was described as a prototype of a space launch vehicle Iran will soon use to put its first domestically produced satellite into orbit. Iranian officials claim the satellite, called Omid-1, is ready to go and could be launched into space this summer, or even as early as June. Mr. Ahmadinejad said it was a three-stage rocket, that the first stage came back by parachute, the second came down after 300 seconds and the third “was sent toward orbit.” Others reported that the rocket went to an altitude of 70 to 100 miles. Iran’s defense minister said a goal of the space program was to produce and orbit remote sensing (spy) satellites. An Iranian regime using reconnaissance satellites to target its ballistic missiles would increase the danger to Israel and U.S. bases in the Middle East. But the main significance of a three-stage rocket capable of putting a satellite in orbit is that it also could send a warhead thousands of miles to any target in Europe. If modified with strap-on boosters or other additional thrust, such a rocket could be an intercontinental ballistic missile capable of reaching North America. That is why North Korea’s 1998 launch of a 3-stage Taepodong missile, which it also claimed was for launching satellites, generated so much concern. Just last month, Lt. Gen. Henry Obering, head of the Missile Defense Agency, said a missile defense is needed in Europe because Iran is “developing missiles today at an accelerated pace.” He said Iran was the third most active country in the world, after Russia and China, in flight-testing ballistic missiles, and that Tehran is developing missiles that can reach far beyond what it needs to hit targets in the region. Deputy Foreign Minister Alexander Losyukov said Tehran’s actions “provoke concern” and raise “suspicions” about its claim not to be building a nuclear weapon, since a long-range rocket is a key component of any nation’s nuclear weapons capability. If that capability is combined with a nuclear warhead, Iran would be the first Muslim nation with a global nuclear reach. With his arguments against the planned missile defense sites in Poland and the Czech Republic in shreds and his foreign minister deploring Tehran’s continued development of missiles and nuclear fuel, one would expect Mr. Putin to cool his rhetoric against missile defenses and support stronger sanctions against Iran. In fact, just a few weeks ago Foreign Minister Lavrov did agree at a Berlin conference of world nuclear powers to increase travel and financial sanctions on Iranian officials. But Moscow continues to oppose the more stringent trade and economic sanctions on Iran favored by Washington. And in the run-up to next month’s presidential election, Mr. Putin has been especially belligerent toward the West, threatening to target Russian missiles on Poland, the Czech Republic and Ukraine. Despite Tehran’s continuing enrichment of uranium in defiance of the United Nations and its public display of modified multi-stage missiles, Moscow as yet appears unwilling to compromise on missile defenses in Europe. The only course is to pursue final agreements with our Polish and Czech allies, coordinate with NATO, and begin work on the sites in Europe. This year, Congress should support the president’s request for funds for this purpose in the fiscal 2009 budget.